Arlington ISD > Bowie High School > Blog > Front Page News > Congratulations Jada! 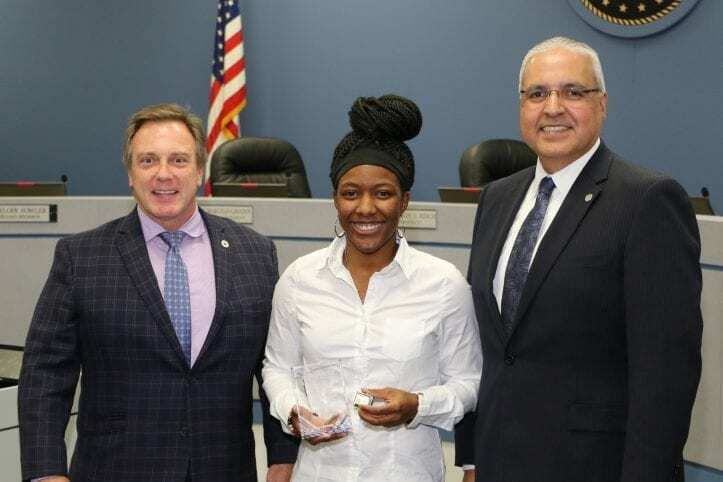 Congratulations to Jada W., a senior at Bowie High School and the AISD November 2018 High School Student of the Month! Jada is a student with a big heart and love for serving others. Jada is in AVID and plays basketball for Bowie, earning AISD Defensive Player of the Year last season. She is on track to graduate with a distinguished level of achievement. When she’s not busy with school and extracurricular activities, Jada can often be found volunteering. She volunteers at Mission Arlington each Thanksgiving where she helps deliver turkeys and Thanksgiving food to deserving families, and she also is there during the winter to help run Mission Arlington’s Christmas store. She spends time at homeless shelters and helps put together bags full of hygiene products to deliver to those in need. Jada, who plans to attend Clark Atlanta University in Georgia next year, is a great representative of Bowie High School. Congratulations, Jada!